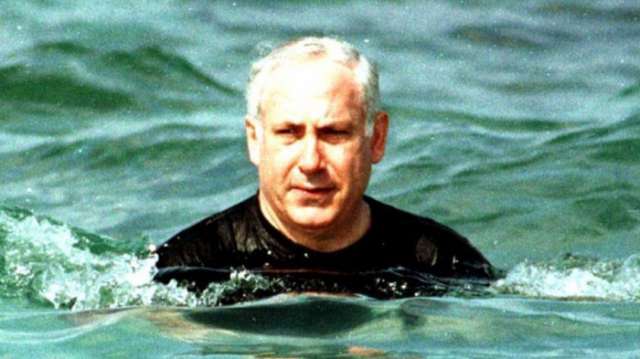 An official with Iran's Revolutionary Guards has warned Israeli PM Netanyahu to "practice swimming," saying he'll soon have no other choice but to flee the region. It comes as Tehran accuses Israel of spreading Iranophobia. "Netanyahu should know that there is no way for him except fleeing the region and so he needs to learn how to swim in the Mediterranean Sea," Brigadier-General Hossein Salami said during a Friday address to a group of IRGC commanders and officers in the central Iranian city of Isfahan, as quoted by Fars news agency. His comments come after Netanyahu addressed the UN General Assembly (UNGA) a little over a week ago, stating that its arch rival Iran has "another secret facility in Tehran, a secret atomic warehouse for storing massive amounts of equipment and material from Iran's secret nuclear program." Netanyahu has intensified his statements that Iran is developing nuclear weapons since the US, Israel's biggest ally, pulled out of the Iran nuclear deal. He reiterated at the UNGA meeting that Israel will never let a government that calls for its destruction to develop nuclear weapons. "Not now, not in 10 years, not ever." Iran's foreign ministry responded to those comments by stating that the world "will only laugh loudly at this type of false, meaningless, and unnecessary speech and false shows." Foreign Minister Javad Zarif also took to Twitter to state that Israel is the only country in the region with a "secret" and "undeclared" nuclear weapons program - including an "actual atomic arsenal." Tehran does not recognize Israel as a country, and regularly warns that it will soon cease to exist. Syria is another bone of contention between the two countries, with tensions becoming even worse after Israel vowed to prevent Iran from establishing a permanent military presence in Syria and carried out dozens of strikes against Iranian bases. Just days ago, Netanyahu welcomed a historic $38 billion in military aid from Washington, with the US State Department noting that the package is aimed at protecting Israel against "all potential regional adversaries," but foremost from the "Iranian regime’s sponsorship of terrorist groups." Netanyahu took to Twitter to express his gratitude, stating that "Israel and the world face complex security challenges, first and foremost Iranian aggression," while calling Washington's "unwavering support" one of the "pillars of the strong relationship between the two countries." Meanwhile, Iran is also accusing the US of interfering in Middle Eastern affairs, stating that sanctions against Iran are driving the price of crude up - and that if Trump wants cheaper oil like he claims, he should stop meddling.